Here are my answers to the questions posed by the Okanagan College Student Union. There will be a forum at the Kelowna Campus of Okanagan College on November 8th, from 10 am til 2 pm, one day before the advanced poll at the campus. 1. Why are you running for Kelowna City Council? I have been honoured to serve the people of Kelowna as Councillor for the past six years. I am proud of the accomplishments over the last two terms, including the opening of the H2O Centre, the creation of many new parks, the expansion of bicycle and pedestrian networks, upgrades to both water and sewer treatment plants, partnerships with the BC and Federal Governments to create supportive housing, and an updated Official Community Plan and Downtown Plan, to name a few. I believe that my skills in listening, communicating ideas and building consensus have been key to my success as a city councillor. Using a balanced decision-making process of consultation, research and vision provides the best outcomes for all of Kelowna’s citizens. 2. Civic Elections have notoriously low turn out, especially among young voters. What do you think the key issues are for student voters in your region this civic election? I have heard from a number of young people about concerns with affordable housing, transit, job opportunities and the environment. It is important that student voters ask candidates how they plan to address these key issues. 3. Summarize your position on maintaining a balance between environmental sustainability and economic development. How important is it – and is a balance currently being maintained in your community? When I first was elected to Kelowna council in 2005, there were only a handful of initiatives that addressed environmental sustainability in council policy. Today there are numerous policies that I am proud of – including wetland and foreshore protection, environmental development permits, climate change plans and more. Of course it is important to maintain a balance with economic development – but I believe this can be done without sacrificing either. The City needs to consider mandating such things as green building design, district energy systems, native and edible landscaping, urban tree canopy and grey water recycling, while providing incentives and education for continued economic success. 4. What role, if any, do you feel municipal governments should have in the development of affordable housing? Housing can be looked at as a spectrum, beginning with supportive housing, continuing through rental availability and reaching right up to home ownership. The city has the most influence on supportive housing through partnerships with provincial and federal governments. Over the past 6 years the city has provided land for 4 supportive housing projects. In terms of rental housing, the city can (and has) provided incentives for multi-family developers to do purpose build rental housing. There has also been great support of secondary suites and the next step should be to allow secondary suites to proceed without council processes if certain standards are met. The city can influence the affordability of market housing by encouraging density in the urban centres and reasonable development cost charges. 5. Would you make a commitment for the community to set a target for affordable housing to be developed each year? What would you do to ensure that these targets were met? Yes. The city of Kelowna already keeps a record of affordable housing needs and I believe we should continue to look at ways to provide incentives to ensure that we are moving in the right direction. I also support the creation of a housing authority for Kelowna. This was first suggested by the Affordable Housing Task Force, which I sat on in my first term, but has yet to receive approval from council. 6. Would you champion the development of a comprehensive affordable housing strategy for your community? What would such a strategy look like? We are currently in the draft stage of an Affordable Housing Strategy at the City of Kelowna and the recommendations should come to council for ratification in the next months. There are a number of recommendations that I want to move forward as soon as possible to help create more affordable housing. Included in these are increasing the supply of rental accommodation through revisions to the secondary suite by-law and partnerships with developers and non-profits, continuing to partner with senior levels of government to provide supportive housing, increase funding to the Housing Opportunities Fund, encourage six story wood frame buildings, continue to award density bonuses for affordable housing. 7. What transit issues does your community face, and what immediate changes do you think could be made to address them and improve service? We’ve seen great improvement in transit over the past six years but there is more work to be done. I support the creation of a regional system that would oversee routes and timing of buses, with financial and other administration still being done at the BC Transit level. This would allow a much more responsive and accountable system. I support the continuation of the UPass for UBC and the implementation of a UPass for Okanagan College. I also want to see an integrated system for busing of middle and high school students. I firmly believe that transit,along with other alternate modes such as bicycle, pedestrian and car-pool, will be the future of transportation for our region and we must lay the groundwork for that now. 8. While our region’s senior population continues to grow, recent graduates are looking beyond this region for career opportunities. What is your position on this situation? Affordable housing, a vibrant cultural scene and great sports and recreation opportunities are part of the solution to keeping recent graduates in Kelowna, but the big answer is careers. Kelowna funds over 60% of the Central Okanagan Economic Development Commission, the agency charged with keeping our economy healthy. In the last year, a Youth Engagement Officer was hired to look at how to create more opportunities for youth employment and the results of his work are eagerly awaited. Business recruitment is another important role of the EDC. We should also support groups like Accelerate Okanagan and the Okanagan Valley Entrepreneurs Society, which help start-ups in the area. As the economy improves, all of these agencies working together will help bring the kind of jobs and opportunities to Kelowna that young people need. 9. Why should student voters in your region choose you for City Council? I am committed to continuing to hear the voices of all my constituents, including students. I have been engaged with youth through the Mayor’s Youth Forums for six years now and plan to expand that mandate to include post-secondary students in the next term. I will keep the lines of communication open through my presence on social media (@michelerule on Twitter, /VoteRule on Facebook). I believe that long-range plans made up of short-term attainable goals in the areas of environment, social responsibility, culture and economy will provide a healthy community for all of our citizens, now and in the future. For a balanced approach to decision-making, please vote Rule on Nov 19th (or Nov 9th on the Kelowna Campus of OC!). Michele Rule was born October 11th, 1966, to parents Arina (Rini) Imthorn and Larry Runnalls. Her mother was remarried in 1974 to Marinus (Rene) Elyzen. She has one brother, three step-brothers, one step-sister and two half-sisters. She attended Glenmore Elementary School, Dr. Knox Junior High and Kelowna Secondary School, graduating in 1984. 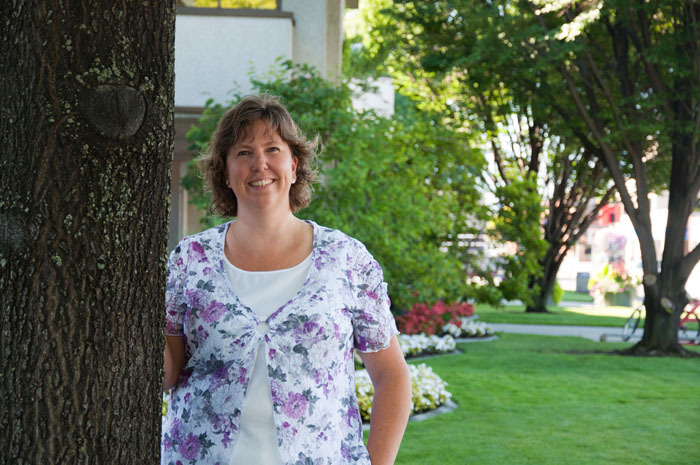 Michele attended Okanagan College for two years and then received a B.A. in Arts (Canadian Literature and Canadian History) from the University of Victoria in 1990. Michele spent two years abroad in the late 1980s, one year in Germany and Holland and another in Japan. She is a single mom with two boys, Justin aged 18 and Thomas aged 11. Michele spent six years serving as city councillor for the City of Kelowna. Michele was honoured to sit on 12 council committees as well as serving as a regional district director and library trustee for the past three years. Michele first became interested in local politics in the early 1990s. Returning to Kelowna from Victoria, she saw the growth that was occurring and realized that city council's decisions were key to shaping that growth in a way that would create a vibrant economy but maintain and enhance the quality of life that made Kelowna such a desirable place to live. When Michele's terms ended in 2011, she began consulting in areas of local government interest including planning, public consultation and council/district presentations. Her firm, Rule's Consulting, is located in beautiful Kelowna, B.C. but she is available to work across the province. Currently Michele is working full time for Okanagan Regional Library as Communications Manager. She enjoys the challenge of managing all aspects of communications for the 29 branches spread over a geographic area the size of Ireland! Sayid Mansour Me too. I'd vote for her. Max Arthur Great article about Norm. Good man. Michele Rule © 2019. All Rights Reserved.